Cassini grabbed the images with its composite infrared spectrometer (CIRS) during a 13 February fly-by of the 396-kilometre diameter moon. NASA explains that scientists "expected smoothly varying temperatures peaking in the early afternoon near the equator", but instead "the warmest region was in the morning, along one edge of the moon's disk, making a sharply defined Pac-Man shape, with temperatures around 92 kelvin". 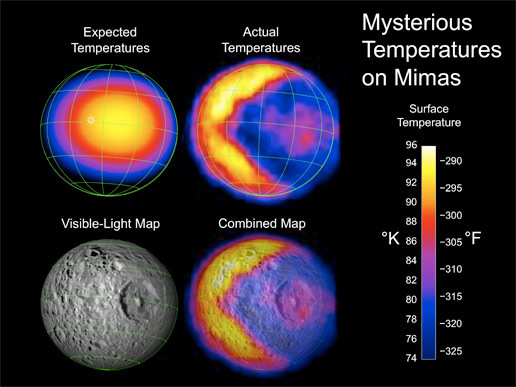 The agency elaborates: "The rest of the moon was much colder, around 77 kelvin. A smaller warm spot - the dot in Pac-Man's mouth - showed up around Herschel, with a temperature around 84 kelvin." While the Herschel warm spot "makes sense because tall crater walls (about five kilometres, or three miles, high) can trap heat inside the crater", the Cassini boffins are baffled by the Pac-Man phenomenon. Mimas is believed to be mostly water ice, with a small amount of rock, and Cassini CIRS team member John Spencer said: "We suspect the temperatures are revealing differences in texture on the surface. It's maybe something like the difference between old, dense snow and freshly fallen powder." NASA summarises: "Denser ice quickly conducts the heat of the sun away from the surface, keeping it cold during the day. Powdery ice is more insulating and traps the sun's heat at the surface, so the surface warms up." Such surface texture variations wouldn't, though, explain why Pac-Man is so clearly defined. Spencer suggested his mouth may have been formed by the impact that created Herschel Crater, which "melted surface ice and spread water across the moon". This liquid would then may have "flash-frozen into a hard surface". Spencer expressed doubts, however, and conceded it's "hard to understand why this dense top layer would remain intact when meteorites and other space debris should have pulverized it by now".